Notes from the Dog by Gary Paulsen. Review: Many people are inspired by smaller stories written in a non-fiction form, I read this book and this story inspires me so much. Notes From the Dog is a book about a boy named Finn, his best friend (that is basically living with him), and his dog Dylan. One day Finn and Dylan got a new neighbor, and her name is Johanna she has breast cancer. Finn and Matthew were helping Johanna raise $10,000 in sponsorship money for a triathlon that Johanna was participating in. About midway through the story just a day before the triathlon Johanna gets sick and cannot attend the triathlon but instead Matthew and Finn attend it because they know that this triathlon meant a lot to her. The notes that the dog writes are actually written by Johanna and quite frankly the notes are very philosophical. At first Finn thought that Dylan was writing the notes but then realized that Johanna was writing them. Overall the book is amazing, I recommend Notes From the Dog to anyone who loves heartwarming books and stories. This story made me actually think about my life decisions and helped me make better ones. It has a moral, which is to basically help everyone and treat everyone with respect whether or not you are friends with him or her. Even if you don't know them still show them, respect to show that you are a good person. Notes From the Dog is for people at about the age of 12-14 because this book has some strong language and the maturity of the issue and the way it was presented. This book has really touched me, and I know that this will really touch you. I highly recommend this book. We would like to thank Ember Publishing for providing a copy of Notes from the Dog for this review. 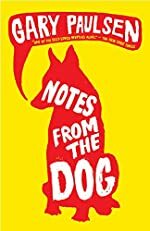 Have you read Notes from the Dog? How would you rate it?